What makes a strong candidate? Have a B.S. degree or equivalent in unrelated field (ex. Business) and 2 years of experience working within a scientific or engineering group for a biotechnology or pharmaceutical company or related industry. Students who have a 3.0 GPA (on a 4.0 scale) in the last 90 quarter credit hours (60 semester credit hours) and meet prerequisite requirements. Students who have a BA/BS degree with under a 3.0 GPA and have 2 years work experience may be approved for GNM status for Basic Biosciences. 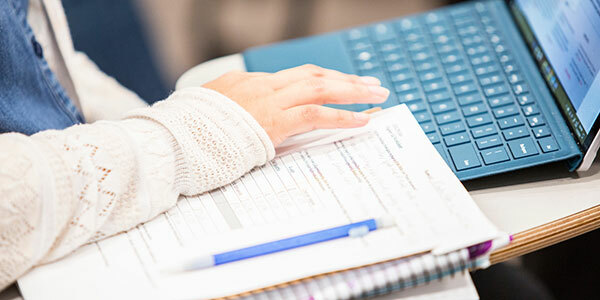 Students who receive a 3.0 or above in their Basic Biosciences courses and apply for the degree program while under GNM status are considered for degree admissions. Applicants who have a bachelor’s degree other than a B.S. (ex. B.A. degrees), professional experience, and completed recommended prerequisite course work will also be considered for admission. ** Applicants should complete the prerequisite courses with a 2.0 or greater before applying to the degree program. Students whose undergraduate degree majors are in engineering, biology, chemistry, or pharmacy are exempt from the prerequisite course requirement. Chemistry: Minimum of 2 quarters (1 semester) of college general chemistry. Additional course in organic chemistry is recommended. Please note that admission to the degree program is not guaranteed, even if you choose to take the Pharmaceutical Bioengineering Certificate prior to applying to the Master’s program. What are the degree program requirements? The requirements to earn the Master of Pharmaceutical Bioengineering can be completed in approximately 1 and ¾ to 2 years. Program requires completion of 38 credit hours within the program and with a cumulative GPA of 3.0 or better. How many classes would I take? The PharBE program is a non-thesis program. 38 total course credits (including four credits of Department Seminars, taken Winter and Spring Quarter only and two credits of PharBE seminar) are required to earn the degree. What is the difference between PharBE Certificate and Degree Registration? The biggest difference you will see in registering for courses as a degree student is that the registration form we send out is different, showing all degree courses offered every quarter, instead of just the certificate courses. Also, degree students have to pay some additional student fees that certificate students are exempt from paying (although you do get to take advantage of the extra campus services supported by those fees). Otherwise, the process is the same. Use the degree registration form to register through the UWPCE registration office via phone, mail or in-person (sorry, we still don’t have on-line registration yet). What is the cost of the PharBE program? The Master of Pharmaceutical Bioengineering program is managed by UW Professional and Continuing Education. Fees are charged on a quarterly basis.Tuition is charged per credit and typically changes each year. Students in the Master of Pharmaceutical Bioengineering program complete 38 credits, typically over 7 quarters. Does this program qualify for financial aid? Yes, PharBE does qualify for financial aid. Student must take at least 5 credits in a quarter to be eligible. If additional credits are needed to have 5 credits during the program, please contact the Graduate Academic Counselor. If you are using financial aid to pay for tuition, you will need to fill out and return a PCE Payment Agreement form when you register each quarter. This form will be emailed to your UW email account along with your registration materials each quarter. Disbursement of financial aid funds from the University Student Accounts Office to PCE occurs approximately two weeks before the quarter starts. If your total tuition and fees are greater than your financial aid award or if you register after disbursement occurs, you will be invoiced for any tuition and fees owed. When aid is disbursed, you are responsible for paying your tuition invoice with the PCE registration office. If you are receiving aid from The Child Welfare Training and Advancement Program (CWTAP), you will fill out a PCE payment agreement form as mentioned above, but the CWTAP funds will be dispensed directly to you. You are then responsible for paying your tuition statement with us. If you have any questions about this program, please contact their office directly. Is this program eligible for the tuition exemption benefit offered to state and UW employees? No, the tuition benefit exemption applies only to state-funded programs. Since fee based degree programs receive no state funds, they are not eligible for the tuition exemption benefit. I am a foreign national. Can I pursue the PharBE program? As this program is offered entirely online using a distance-learning model. International students may be admitted to the program, but are still not eligible for F-1 visas for travel to and residence in the United States. PharBE does not qualify as full-time study, and therefore does not meet requirements for an F-1 Visa. However, if you are an F-1 student currently enrolled full-time in another program, OR you are in the U.S. on some other type of visa (not F-1), you may be eligible to take a certificate program or course. Where can I learn more about job opportunities in the Department of Bioengineering or on the UW campus? Visit UWHires or Handshake to learn about employment opportunities. What are the deadlines for your graduate programs? Is there a minimum GPA and GRE score? The GRE scores and GPA’s vary more significantly, because more emphasis is placed on professional experience. The only way the GRE requirement can be waived is if you have previously earned a Ph.D. Individuals with Doctoral Degrees of any type are not required to submit GRE scores. However, GREs may help determine a student’s qualification and may improve an application for those who do not have a PhD in a relevant scientific field from an accredited university. Do I have to take the English Language Proficiency Requirement? Please refer to the UW Graduate School Memo 8. Please review our instructions on how to apply to the PharBE program. Do I need to send paper copies of my GRE and/or English Language Proficiency Exam scores? No, GRE scores need to be sent electronically, directly from ETS to University code: 4854. Whom do I ask for recommendations? Professor recommendations and professional recommendations are acceptable, as long as you have/had a substantial working relationship with that manager or professor (i.e. you attended multiple office hours and the professor can discuss your work over a length of time in detail). Graduate Non-matriculated (GNM) is a student status at the University designed to provide access to graduate courses for qualified individuals who are not currently matriculated in a graduate program, but who may later wish to apply to a graduate program. The graduate department in which the student seeks GNM status evaluates the applicants. The department determines whether a student is qualified to do its graduate-level coursework.Please note: Acceptance into the GNM program does not guarantee acceptance into the degree program. If a student wishes to take graduate-level courses but does not plan to apply the credits to a specific graduate degree, then the student should register as Non-matriculated (NM) – not Graduate Non-matriculated (GNM). For more information about GNM status and non-degree enrollment for UW credit, see the Non-Degree Enrollment website. Is GNM status available to international students? Why should I consider applying for GNM status? How do I apply for GNM status? Complete an online UW Graduate School application. What are the application deadlines for GNM? What is the cost to take courses as a GNM student? GNM students pay the same course tuition fee, technology fee and UWPCE registration fee as degree students. GNM students do not pay the quarterly “Other Mandatory Fees” or the UPASS fee that the degree students must pay. When and how will I be notified of the admission decision? What do I do if I haven’t heard yet from UW? If you are waiting to hear, please check the email account you submitted with your online application and also log back into your application profile. Non-Degree Certificates: Please contact UW Professional and Continuing Education.